The new model arrives two years after the Model B and boasts a slew of new features. The Raspberry Pi Foundation has revealed B+ as the newest addition to their line of mini computers. The Model B+ is available starting today at $35- the same price as its predecessor, the Model B. You can order the new board online via the Raspberry Pi Foundation's two primary manufacturing partners (Element 14 and RS Components). In a blog post, the Foundation stated that the new model is not a "Raspberry Pi v2", but instead a final revision to the original Pi board that features the same 512 megabytes of RAM and Broadcom BCM2835 SoC as the Model B. On the topic of new features, the B+ now comes with 40 pins on the GPIO header, which keeps the same pinout mapping for the first 26 pins as the model B. The number of USB 2.0 ports has been increased from two to four, which allows for more flexibility by eliminating the occupation of a port in order to use a mouse, keyboard, Wi-Fi dongle, or USB thumb drive. The standard SD card expansion has been replaced with a microSD slot and has a push to release mechanism built in. Concerning energy, the Foundation was able to reduce power consumption of the new model, and the audio circuit now has its own "low-noise" power supply. Finally, the Model B+ has a new form factor and component layout that includes rounded corners. 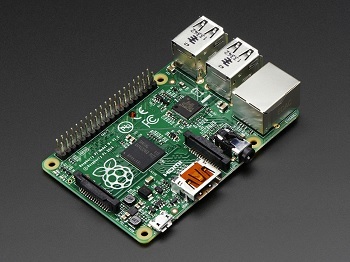 To appease fans of the regular Model B, the Raspberry Pi Foundation assured that the older board will stay in production as long as there is demand for the outdated model. It is unknown whether or not the Model B will get a reduced price- but as of yet, it is still being sold at the same price. Plan on purchasing the new and improved B+? Let us know in the comments!